We have introduced a new feature on the Kite web context menu. 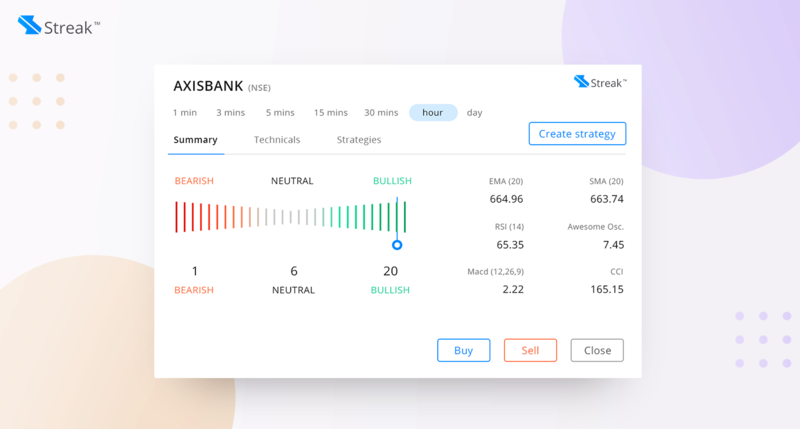 With Technicals powered by Streak, you can now quickly have a technical view on a security based on the most popular indicators. Currently, available on Kite web, you will soon see this utility on Kite 3.0 mobile slated to launch soon. Shows an overall technical view for the security using 25 of the most popular oscillator and moving average indicators. By default, the technical view is based on an hourly time frame, but this can be changed between 1 min to 1 day based on your style of trading. Displays technical views based on average and oscillator indicators separately. Also lists out individual indicator values of all the 25 technical indicators used to form a view. Please note that the indicator values and hence the overall view are both static and not streaming. What this means is that if you have kept the technical view tab open for a while and want to see the latest update, either refresh the page or change time frames. The most powerful aspect of technical analysis is the ability to backtest strategies and select the right ones. With Streak, now even a non-programmer can write, backtest, and deploy strategies to generate an alert to trade when a signal is generated. 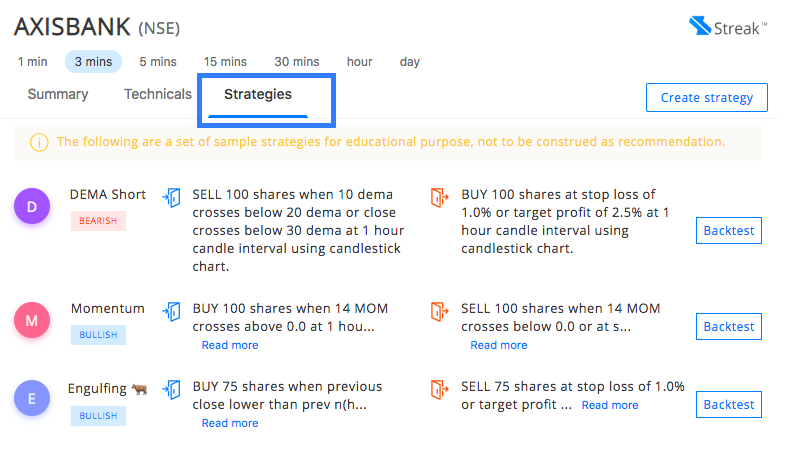 To help you get started we have listed some popular strategies. Give it a shot and get started trading with discipline. This will be available in the new Kite app. We’re currently testing the app and it’ll be available in February. Pls update the mobile alert feature, the alert must be sent through mobile SMS. SMS alerts aren’t really reliable, so not something we’re looking at right now. There is a very strong need for sending SMS once the target rates are achieved. If SMS is not feasible, at least an Email will be good. Plus a notification on the KITE mobile app. Not Important . SMS services can disturb on treading time. 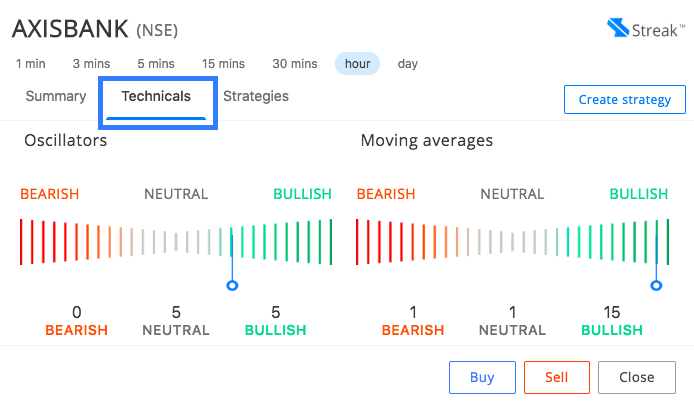 Thanks for adding new feature( technicals). No dear. In India, you can only trade those currencies which are pitted against INR. For example USDINR, EURINR, JPYINR etc. You cannot trade any cross currencies such as EURUSD or USDJPY or AUDUSD etc. If you want to trade in currencies better switch to FOREX as in India the currency derivative market is not much liquid. PLEASE START SMS SERVICE WHENEVER BUYING/SELLING ORDER EXECUTED. It’s great to have such features on Kite mobile app. It’s a most needed for taking a position with indicators all around. Always Zerodha, a technological marvel. Will it be applicable for futures too?. And commodity also? Thank you for the feedback. Yes, you can check out futures of stocks and commodities. Thank you,very much.Best wishes for your endeavour. वेस्ट ऑफ मनी फ़ॉर सिमी ऑटो वेस्ट वेस्ट वेस्ट वेस्ट। ………………………………………..
Our tech team is working on it. We should release it by March. As per regulatory framework, the user has to click on buy or sell order, it cannot be automated. Please start trade voice alerts and notifications on kite, so that we don’t need to keep checking our mobile multiple time. This looks quite interesting, but I dont find a context menu of Kite web. Zerodha under you is doing a wonderful work by adding more analytics, please keep adding value by this way to the consumers and am sure you will have loyal consumers always. Transparency is another good thing i see here. All the best to you and your wonderful team. Thanks a lot for your kind words, Streak and Zerodha are committed to help traders by bringing state of the art technology. Where we get ending total traded value? once the strategy is deployed, will the order be automatically triggered with entry and exit mentioned in strategy ? Thanks a lot for your kind words, Streak and Zerodha are committed to help traders with the help of technology. Alert service for scrip (cash and future) required by almost all traders while they are away for trading terminals. Check out Sentinel, that allows you to create alerts. With all these great features, I need to bring this to your notice that Streak is sending the signals late sometimes. I will share the screenshots separately to streak team. Are you expecting the notifications to pop as soon as the signal candle opens ? When we can have stochastic Rsi in kite? Please do provide Upper and Lower circuit levels for the day for stocks. Its one IMPORTANT thing , thats missing for many years now. Can u Provide some more details about this? Is it paid? why i can’t avail the technicals service please help me in this regards. Kite is a web platform, Vilas. Just head over to https://kite.zerodha.com and log in. Why I unable to log in after updating my kite app in Mobile Now.. And how can I log in to the account. I have open Zerodha account before one month and I have send POA form three times but you are not provide any updates and my Purchase share not show in my account. My last POA form your Bangalore office receive 28-01-2019 but not update in my account. I have facing problem to sale my share so please resolve this problem. Where I can find Ledger? It is not available in console Report section. It’s now called ‘Statement’ under the ‘Funds’ section. You can pin and instrument you want to the marketwatch. Hey Dinesh, you can look up and questions you have on our support portal. If you don’t find what you’re looking for, you can raise a ticket on the portal itself. wow, its very useful for trading, great…. … and fundamental analysis too…. please add data box showing moving averages plotted on the chart. Nithin and Matti.. can you explain why you blocked (1) bank nifty option trading bellow or above of almost 1% up or down (2) and All type CO / BO order block if you feel market will be volatile ?? Please don’t give excuse about NSE circular because i read already it.. it was only for HNI and big traders. Strange thing is in India it’s happen only on your third class plate form. after i switched in another broker’s plate form i never stuck that type of problem. remember if you don’t solve this . .i will share none satisfying comment about your trading plate form and your behavior (Due to you never give that type issu’s reply) on 1 lac + websites. i can do this in one day only and i can send 24 Lac SMS in one day. When exit Position cant show profit/loss Amount…Please Update this. Because When exit my Position I know that the what is I book P&L. Kudos to team Zerodha for a new product innovation, which may prove to be very helpful to retail investors. Hello, I asked a question about NSE/SEBI website page link or document link stating regulations about Autotrading (order without clicking BUY/SELL Button)… WHY That question you have DELETED?? What you felt so wrong in this simple question? Can you please allow using horizontal lines (buy line,sell line and SL line ) to trade in kite , It will be of great help for scalpers. Maybe in the coming days. that is 34 tema crossvr 34 ema pls give me reply thanks. Then give target, stop and other fields and then you can just go ahead and backtest. 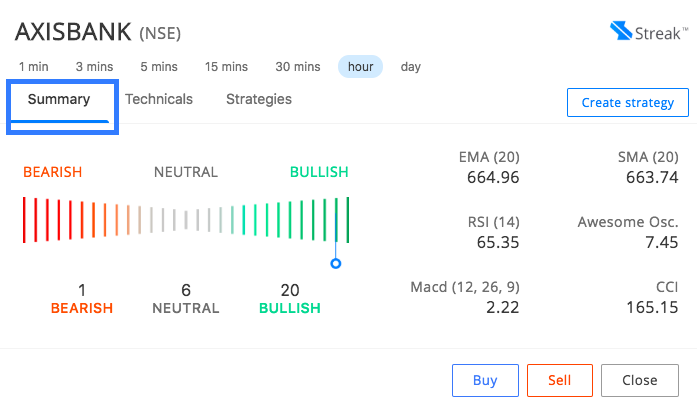 My main holding stocks generally hit either lower circuit or upper circuit, But Zerodha don’t have facility to see what is stock’s today’s lower and upper limit price. for this I am dependent to other trading site like icicidirect.com. I request zerodha to show limit also. I clicked on ‘create strategy’, out of curiosity after getting the popup for ‘Technicals’ from the Kite context menu. Then there was some EULA kind of page, –which also said welcome to your Diwali Offer!? – which I closed (without agreeing or anything). But then, I have received an email saying ‘Welcome to Streak’. So I went back, and agreed to the EULA to see what I had gotten into. There seems to be no pricing, and it says billing via Kite. I am confused, nowhere did I agree to either a free trial or a paid subscription (I do not know which one this is, btw). So, could you elaborate how Streak works – is it free, free to try, or direct subscription? I did not intend to subscribe (without explicitly consenting). Please help me understand (and if required, remedy) the situation. Every client of Zerodha gets 7 days free trial after accepting the terms and conditions. Once your free trial ends, you can subscribe to any of our paid plans from the billing section and continue to use the Streak platform. As of the above comments it looks like your free trial has just begun as you have accepted the terms and conditions. After 7 days your free trial will end if you do not subscribe to any paid plans. Kindly check the billing section for more clarity or write to support[@]streak.tech for more information. Nice Improvement for this, Any direct number for assist to us, because everyone is new for approach this algo for trading, If we need any support directly it is easiest way to trade more . Thank you for writing to us. Streak only has email support for all the clients. We request you to write to support[@]streak.tech. Note: in ultimate plan you get an opportunity to talk to a Streak expert for 30 mins once to get all the questions answered. Streak only supports stocks and futures, we do not support options. Our team is working on math operators and it will take us some time to release it. We request you to kindly write to support[@]streak.tech for more information. Bracket order is not supported for commodities . please provide this feature to commodity as well. Please modify the easy reports generation process. Nice feature, keep up the good work. It’s already available on Kite. It’s available to all Zerodha users for no extra charge. Please update for schedule order for perticular price/time/quantity and type of order which is must require for private job employee so hopefully waiting for this feature. On our list of things to do, Upendra. Should be live soon. Yes, our tech team is working on providing this feature at the earliest. But when the orders are executed there is no notification received. Notification are only received for any news from zerodha. There should be some feature where we can receive when an order is executed. Working on this, Akash. This will be possible on the new Kite app set to be launched this month. Thank you for the valuable feedback. We will pass this request to the tech team.